I think of this quote often, as I know that if I cannot see what I truly am, I will not be able to know others as what they are, and thus will not be able to experience the compassion that arises from the understanding that we are all one being. This portrayal of the High Priestess from the Medicine Woman Tarot is a great illustration of this concept. 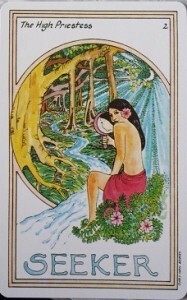 She is seated before a beautiful scene in nature , yet she holds a mirror in from of her face. She knows that in looking at the beauty of nature, she is looking at herself. She is the stream, the trees, the moss, the moon. All things arise out of the consciousness of the universe, and this consciousness is who we are. The High Priestess knows that when we behold something of beauty, physical forms as well as concepts such as wisdom, compassion, truth, or peace, we are merely seeing our own selves reflected back to us. You are currently browsing the archives for the Card Connections category.